Juan Diego Solanas directed and wrote the French Canadian romantic science fiction film, Upside Down. Staring Jim Sturgess and Kirsten Dunst, this futuristic love story is one for the books! 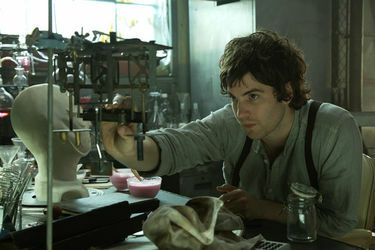 Adam (Jim Sturgess) is searching through an alternative universe for the love of his childhood, Eden (Kirsten Dunst). The movie begins with Adam telling the story of his universe, the story of two planets next to each other; pulled in opposite directions by gravity. The ‘Up’ is the rich and prosperous while the ‘Down’ is the poor. The people down are strictly forbidden to go up. The only way they are able to communicate is through a company called ‘TransWorld.’ Adam finds a mountain which gets close to ‘Up.’ He meets Eden, and years later form a relationship as teenagers. Adam is able to pull Eden down by rope however, they get caught, Adam gets shot and drops Eden. He believes her to be dead but ten years later sees her on TV. He than begins his quest to find Eden, the love of his life. Dexter and Emma (Jim Sturgess and Anne Hathaway) are two college-friends who sleep together on the night of their college graduation, and then they go their own ways while still remaining friends. Dexter goes into the entertainment business and Emma becomes a teacher. The film shows the two of them each year on the anniversary of their college graduation to see where the two are in their lives. Sometimes they’re apart, and other times, they’re together. An original idea for a romantic movie, “One Day” captures the power friendship has in a person’s life. Is it possible to remain just friends after it crosses the line once?